Several of my previous posts on Bitcoin mining with ASICs have focused on devices powered by Bitfury chips. These 55nm chips have dominated the Bitcoin mining scene for months, supplanting the previous generation of 110nm chips from ASICMINER and Avalon. But a new player out of China has been working diligently on their own ASIC chip and product design: BITMAINtech. Their first product to ship was the AntMiner S1, a self-contained mining unit that hashes at around 200 Gh/s. The product has been a big success and BITMAINtech is doing what many before them have failed at: shipping immediately. BITMAINtech has recently followed up their AntMiner S1 with a USB-based mining solution: the AntMiner U1. 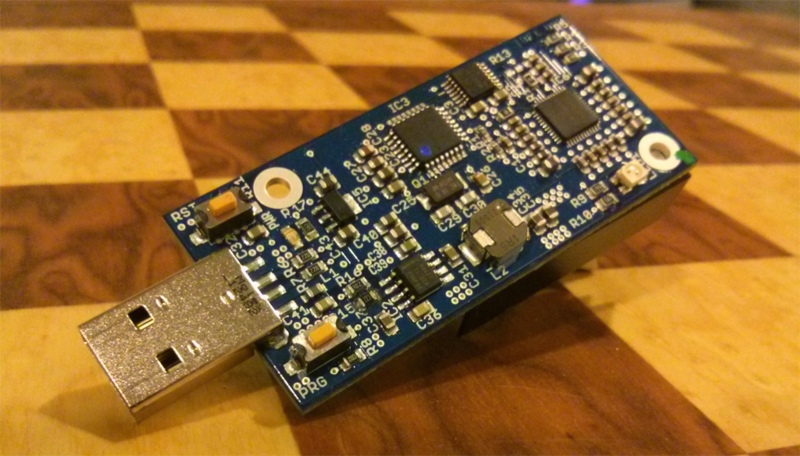 This USB ASIC hashes at 1.6 Gh/s stock and can easily be pushed to 2 Gh/s with built in over-clocking capabilities. The AntMiner U1 is wonderfully low profile, unlike the previous Bitfury-based USB miners such as Ice Fury and TwinFury. It should be no problem to fit these guys into standard, powered USB hubs. They also feature very nice branding on the heat-sinks. I’ve spent the past two weeks working with the author of bfgminer and have created a working driver for the AntMiner U1 in bfgminer. The driver will be included in a future release of bfgminer, but you can follow the steps below to start using the driver and your AntMiner U1 on OS X now! Because my driver code is not yet merged in with bfgminer, for the time being you will need to use a custom Homebrew formula that I have created that will build and install bfgminer from my forked repository. If you are interested in learning more about compiling (and even debugging) bfgminer under OS X, there is a thread here which covers those topics and more. UPDATE: The AntMiner U1 driver is now merged into bfgminer. I’ve updated my instructions below to reflect this. The setup here is identical to the ASICMINER Block Erupter. 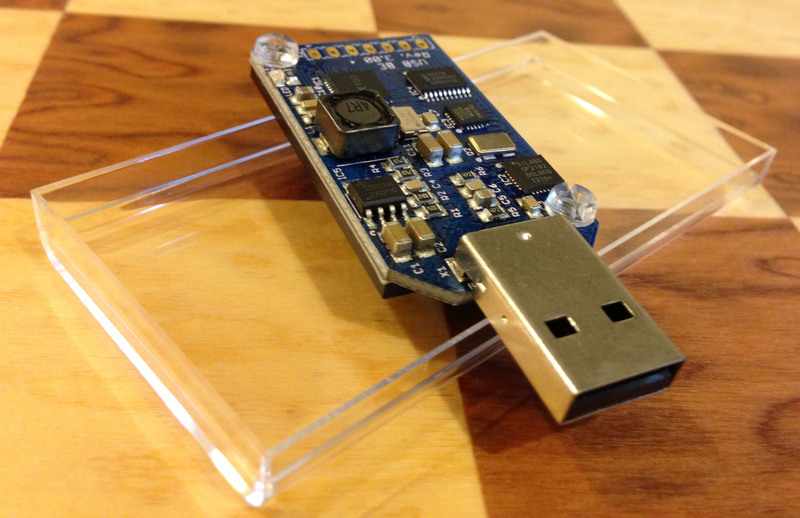 Before mining you will need to install the CP210x USB to UART Bridge VCP driver from Silicon Labs found here. If you have any questions feel free to post them in the comments below or on this thread at the Bitcoin Talk forums. As always – happy mining! This entry was posted in CryptoCurrency, Technology on January 12, 2014 by Nathanial Woolls (Nate). Two new USB stick ASICs are arriving stateside and into the hands of many miners. One is the AntMiner U1, a 1.6 Gh/s USB ASIC from BITMAINtech. The other is Ice Fury, a 2 Gh/s USB ASIC based on the Open Source NanoFury design. I am currently working on code for bfgminer to allow mining with the AntMiner U1 and will cover that in a future article. For now we’ll focus on the Ice Fury ASIC and what it takes to get these little devices mining under Mac OS X. As you can see the manufacturers chose to go with a striking white design and a matching silver heat sink. Like the HashBuster Micro and Twinfury, the Ice Fury USB ASIC requires no installed kernel extension or driver. This entry was posted in CryptoCurrency, Technology on January 7, 2014 by Nathanial Woolls (Nate). Another new ASIC is hitting the streets based on the same 55nm Bitfury ASIC chip found in the Blue & Red Fury USB sticks. This new board, known as the HashBuster Micro, packs nine of the chips found on the Bitfury USB sticks, clocking in at around 23 Gh/s once it is setup and hashing. And, like the previous ASICs I’ve looked at, with a small amount of work is is a wonderful Bitcoin hasher under Mac OS X. The HashBuster Micro board is available from HashBuster.com for 1 BTC, but is currently sold out. You can also purchase them from the Eligius mining pool store. They are 0.86 BTC and ship very quickly (I had mine in four days). Unlike the ASICMINER Block Erupters and Red/Blue Fury USB sticks, the HashBuster Micro is currently only supported by bfgminer. 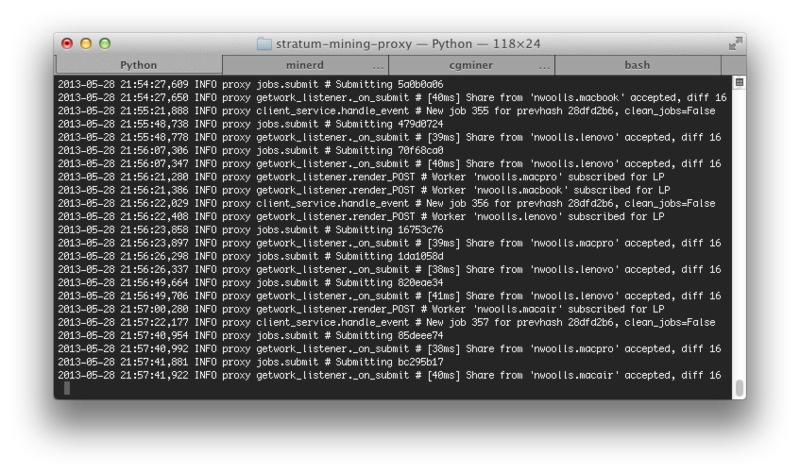 So, the first step is to install bfgminer on OS X. There are several ways to go about this, from compiling bfgminer yourself, to using Homebrew, to downloading a precompiled binary. Unlike the ASICMiner Block Erupters and Bitfury USB sticks, the HashBuster Micro requires no installed kernel extension or driver. Woo-hoo! Feel free to leave any questions below or on this thread on the Bitcoin Talk forums. As always, happy mining! This entry was posted in CryptoCurrency, Technology on December 10, 2013 by Nathanial Woolls (Nate). A new batch of ASICs is hitting the market based on the 55nm Bitfury ASIC chip (abbreviated BF1). The most popular of these are USB sticks branded as either Blue Fury or Red Fury, depending on the color of the onboard LED. The BF1 Fury sticks look very similar to the ASICMINER Block Erupter sticks. However, while the Block Erupters hash at 335Mh/s the new BF1 Fury sticks hash at anywhere from 2.2Gh/s up to 3.0Gh/s. 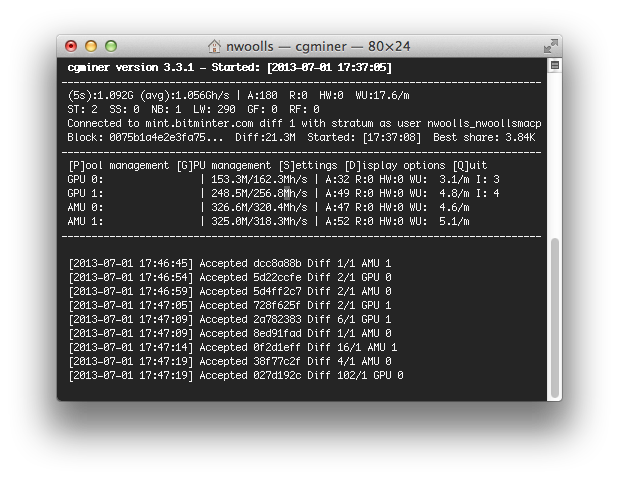 As with the ASICMINER Block Erupters, the first step is to install either bfgminer or cgminer on OS X. There are several ways to go about this, from compiling them yourself, to using Homebrew, to downloading precompiled binaries. As with the ASICMINER Block Erupters, bfgminer requires the correct kernel extension to be loaded in order to detect the BF1 Fury stick. And, as with the Block Erupters, cgminer will fail to detect the BF1 Fury stick unless that same kernel extension is unloaded. Unlike with the Block Erupter there is no driver or software to download. When using bfgminer the Apple Communication Device Class (CDC) driver will be used. When using cgminer that driver (kernel extension) must be unloaded. Feel free to leave any questions below or on this thread on the Bitcoin Talk forums. And happy mining! This entry was posted in CryptoCurrency, Technology on November 21, 2013 by Nathanial Woolls (Nate). While it’s been possible to purchase ASICs (Application Specific Integrated Circuits – chips specifically created to mine Bitcoins in this case) for several months, it has been a difficult and risky process involving auctions on forums with one-way exchanges of money for promises of future hardware. However, recently ASICMINER has made it much easier to purchase their Blades and USB miners. You can pick up one of the USB ASIC miners for around $90 USD (at current exchange rates). One of these will hash at around 333 Mh/s at a fraction of the power usage of modern GPUs. NOTE: if you are going to use bfgminer, at this time you must use the above –HEAD parameter to get the latest changes from Github. Otherwise USB devices may not be recognized automatically. To uninstall the VCP driver from a Mac OS machine, just drag the driver to the trash from the System/Library/Extensions folder (SilabsUSBDriver) and then reboot the machine. To verify if a driver is present, plug in a CP210x device and check the /dev directory for a device named “tty.SLAB_USBtoUART”. If this is not present, it means no VCP driver is active, or that the CP210x device has a VID/PID combination that does not match the driver installed. The VID/PID can be found in the device listing in the System Profiler (even if a corresponding driver is not installed). If you run into any issues you can leave comments below. However, if your issues are specific to cgminer or bfgminer you can find specific forum threads for them here and here. This entry was posted in CryptoCurrency, Technology on July 1, 2013 by Nathanial Woolls (Nate). When it comes to mining Bitcoins and Litecoins there are two major protocols involved: the older Getwork protocol and the newer Stratum protocol. At this point the Stratum protocol has all-but-replaced the Getwork protocol. All major mining pools and mining software support Stratum and Getwork is deprecated. This is usually not a problem, however some older mining utilities (for example the Litecoin CPU miner) do not have Stratum support. And some pools, such as Slush’s Bitcoin pool or WeMineLTC, have limited-to-no support for Getwork. 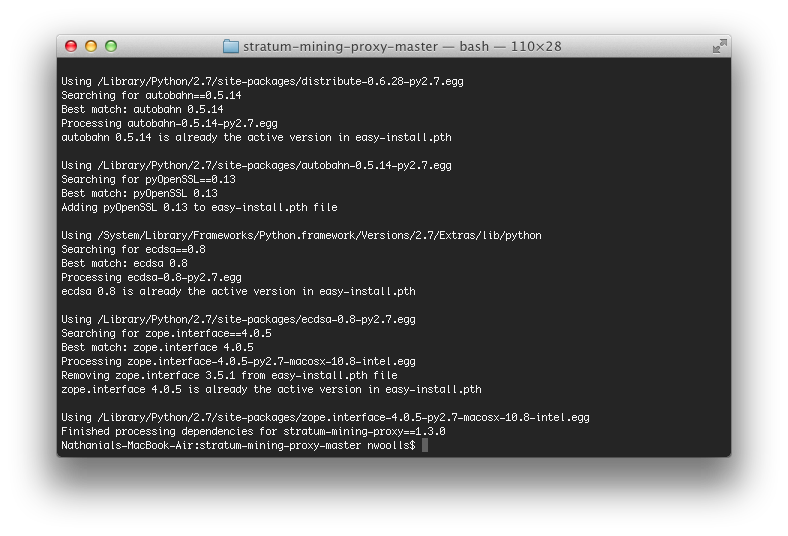 This is where a very nice Python utility called the Stratum Mining Proxy can help. You can use the Stratum Mining Proxy on any computer to connect to your desired Bitcoin or Litecoin pool. Then you can connect your mining software to the IP address of the computer the proxy mining software is running on. All of the Getwork network requests from the mining software will be reshaped into the Stratum protocol and then forwarded on to the mining pool. If you would rather play it safe and stick to as many trusted sources as possible, or if you plan to make use of the Xcode IDE, go with the first option. If you’d rather save some disk space and don’t mind using a widely used – if unofficial – source, go with option two. 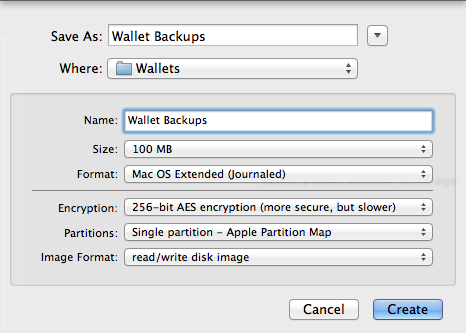 To get started using this option you will need to install the Xcode. Xcode is a free download from the Apple App Store. Next you’ll use Xcode to install the Command Line Tools. Launch Xcode and then click the Xcode>Preferences menu item. Click the Downloads tab and then click Install next to Command Line Tools. If the text next to Xcode Command Line Tools says Installed, carry on to the next step. 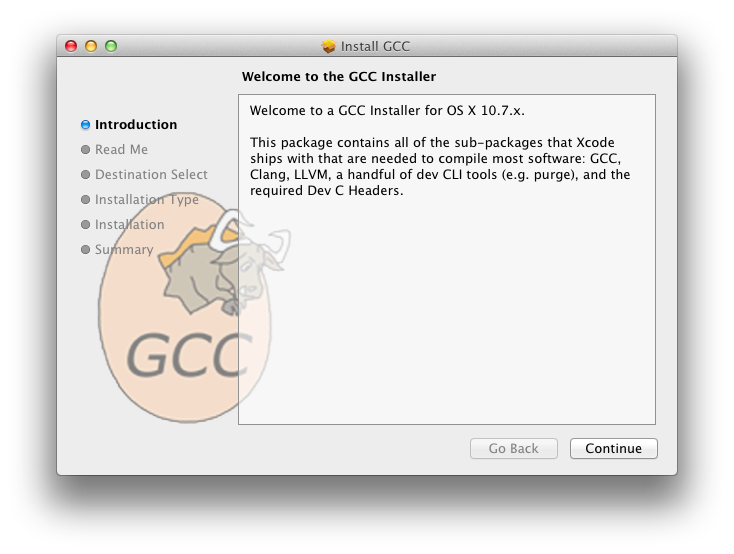 If you would like to install only the GCC Command Line Tools you can download the package for your version of OS X here. 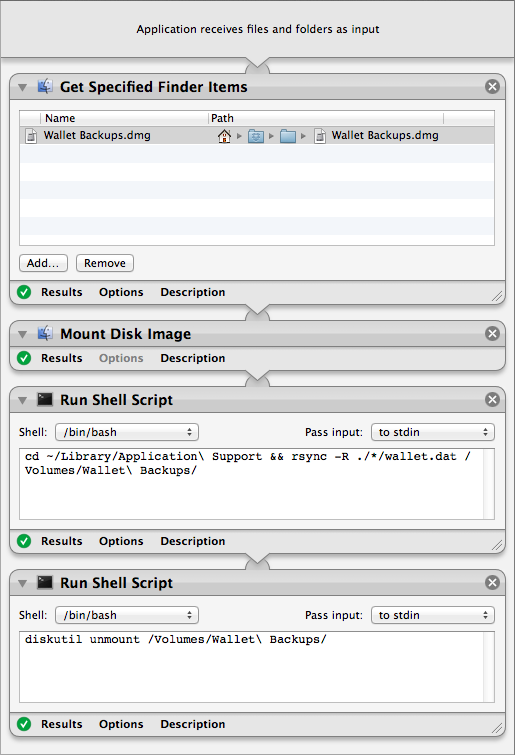 Simply run the setup package after downloading and step through the installer. The original Stratum Mining Proxy project was created by Slush, who also runs one of the more popular mining pools and is very involved in the Bitcoin community and development, from proposing the concept of pooled mining to proposing the Stratum protocol. However his original project is for Bitcoin miners and pools only. In order to support both Bitcoin and Litecoin mining you’ll want to refer to this fork which includes support for the scrypt algorithm used by Litecoin. 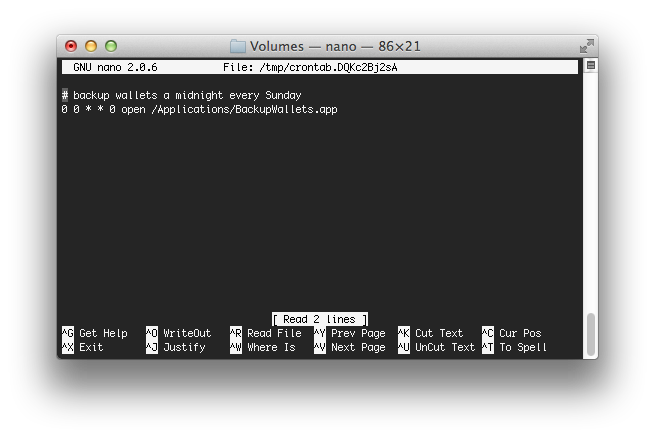 You can either download the latest source as a zip file or use Git to clone the repository. If you downloaded a zip file of the mining proxy source rather than using Git to clone the repository, extract the zip file contents by double-clicking. The mining proxy supports both Getwork and Stratum clients. This means you can use the proxy to consolidate network traffic regardless of the mining protocol. 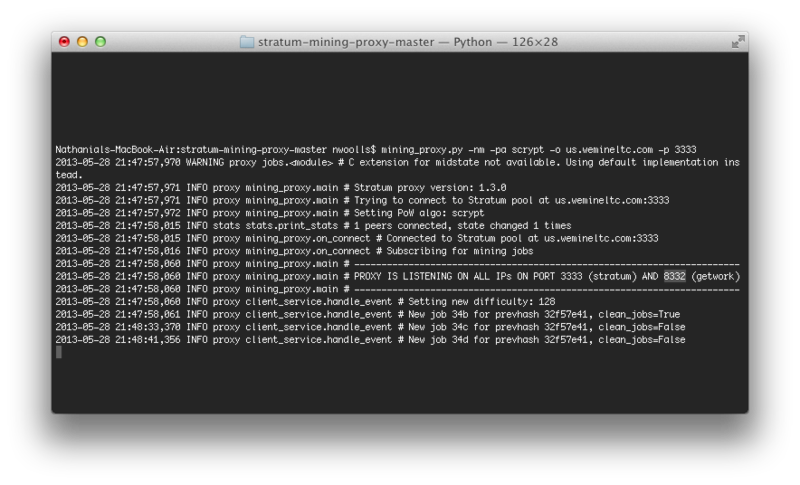 Using the mining proxy gives you a simple way to get a heads-up view of which machines are alive and which are submitting accepted work by referring to the Terminal output. This entry was posted in CryptoCurrency, Technology on May 28, 2013 by Nathanial Woolls (Nate).